To mark the 500th post on this blog, I thought I'd better write something that fitted well with the name 'Apostolic Theology'. 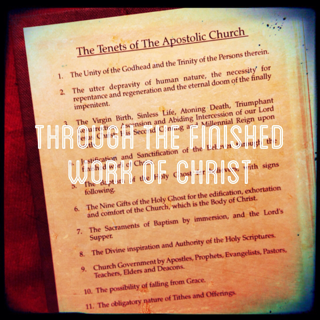 So today's post is about both theology and the Apostolic Church, and to do that we’re going to have a quick look at one of the Tenets. The Tenets of the Apostolic Church consist of only 146 words, and so the desire was for doctrinal precision in as few words as possible. And in that minimal number of words, the words ‘justification by faith’ don’t appear. Oh dear! Isn’t that a bit embarrassing? Surely that means we lose all our good evangelical Protestant credentials? Not at all. For the Tenets say something much better than ‘justification by faith’. You see, if they had simply said ‘justification by faith’ or ‘justification by grace through faith’ that wouldn’t be enough to tell us very much. The Roman Catholic Church would have no problem with a statement like that – they believe wholeheartedly in ‘justification by grace through faith’. So saying that wouldn’t be enough to specify what we believe. We’d need to add more words to explain. The word that makes the difference between what Catholics and Protestants believe about justification is the word ‘alone’. We believe not simply in ‘justification by grace through faith’, but in ‘justification by grace alone through faith alone’. So we could have said that in the Tenets – but we didn’t. You see, that’s a true statement of what we believe, but if we want to use it as a confessional statement (which the Tenets are), we’d have to explain a good bit more, for there’d still be the possibility of misunderstanding the words ‘grace’ and ‘faith’. We do believe in ‘justification by grace alone through faith alone’, providing we properly understand what we mean by ‘grace’ and ‘faith’. But many people misunderstand grace and faith. Many people think of grace and faith as things which save us. They might think of grace as a thing we get and by having it, we have what we need to get saved. They might think of faith as a thing we do, and if we do it we get saved. Or they might think of it as a thing we get, and if we have enough of it we’ll get saved. Or people might think of grace merely as a principle by which God is bound, sort of like some sort of law of the universe. There are all sorts of ways people misunderstand grace and faith. So, if we were to say ‘justification by grace alone through faith alone’ in our confessional statement, then we’d need to add in another few tenets to clearly define grace and faith. In fact, back at the time of the Reformation, that’s how some of the Reformers preferred to speak about justification. John Knox, the Reformer of Scotland, always spoke of ‘justification through the blood of Christ.’ Why? Well, because he didn’t want people thinking that grace and faith were THINGS that saved. Only Christ Crucified saves. So, with that in mind, you can see that grace and faith do come into the Tenets. It’s all there in Tenet 4. And there’s more too. Tenet 4 really is the genius Tenet, because it says so much, so clearly, and yet so succinctly. ‘Justification and Sanctification of the Believer through the finished work of Christ.’ In those words we see that if we partake of Christ’s finished work, then we partake of justification and sanctification. We see that justification isn’t sanctification, and sanctification isn’t justification. And yet we see that justification and sanctification can’t be separated, because we receive both by partaking of Christ’s finished work. So that means we can’t be sanctified without being justified and, if we’re justified, we’ll certainly be sanctified. And then finally, Tenet 4 tells us that it’s ‘the believer’ who partakes of Christ’s finished work and all its benefits; so we’re justified by faith alone. So, through the One Gift that is Christ and Him Crucified we receive double grace – Justification and Sanctification in the Beloved. This is the faith we confess, and this is the genius of Tenet 4, for it points us to the riches of grace that we have in Christ. Reclaiming Faith: Stop Believing "for" things! Meanwhile, Elsewhere - Some really good links!